Copyright © 2013 Richard H. Schwartz et al. This is an open access article distributed under the Creative Commons Attribution License, which permits unrestricted use, distribution, and reproduction in any medium, provided the original work is properly cited. Pott puffy tumor is almost always associated with an outward extension of suppurative acute frontal sinusitis. Pathogenesis includes osteomyelitis of the frontal bone with local spread of the infection to the outer cortex and termination of the suppurative process in a frontal subgaleal abscess. An unusual ectopic location of Pott puffy tumor is the tempo-parietal subgaleal space, located exterior to the squamous portion of the temporal bone. In this location, Pott puffy tumor is considered a suppurative complication of otomastoiditis. 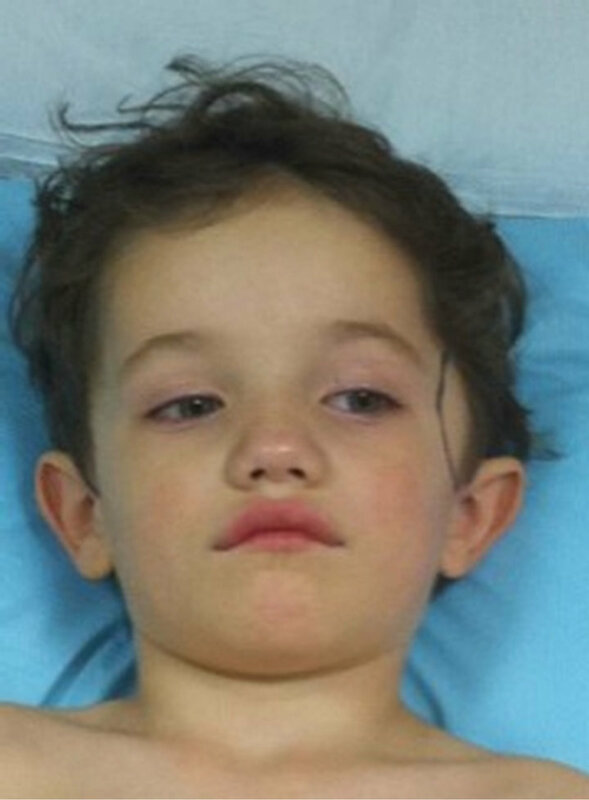 Reported here is a 4-year-old boy who developed amoxicillin-resistant acute otitis media, silent mastoiditis, temporal bone subperiosteal abscess, subgaleal abscess, and an epidural abscess. He had several fenestra of the tegmen mastoideum as a result of osteiitis of the temporal bone, which we believe permitted spread of the oto-mastoiditis to temporal bone, subgaleal space, and epidural space. Surgical specimens obtained from the middle ear and subgaleal abscess after 24-hours of intravenously-administered combination antibiotic therapy did not reveal any aerobic or anaerobic bacterial pathogens. This is only the second such pediatric case that we found during a careful search of the literature. Pott puffy tumor is typically associated with a subgaleal abscess of the forehead that is a complication of acute suppurative frontal sinusitis. Percival Pott’s original description of a “puffy, circumscribed, indolent tumour of the scalp, and a spontaneous separation of the pericranium from the scalp under such a tumour” does not strictly limit the location of the boggy mass to the forehead . The subgaleal region of the scalp overlying the squamosal portion of the temporal bone is rarely the ectopic site of Pott puffy tumor. We were able to locate only one previously published case of ectopic Pott puffy tumor in a child who has silent mastoiditis with spread to the temporal bone . Suppurative mastoiditis usually remains confined to the mastoid cavity, mastoid bone and overlying soft tissue of the scalp. The infection may less commonly extend beyond that localized region, migrating to the upper section of the temporal bone, the meninges, and into the brain. Suppurative complications of acute mastoiditis include osteomyelitis of the temporal bone; sigmoid or lateral dural sinus thrombosis or jugular vein thrombophlebitis; Bezold neck abscess; epidural abscess; subdural empyema; pyogenic meningitis; brain abscess; and facial nerve palsy [3,4]. Mastoiditis spreads out of the mastoid space by means of interosseus emissary veins of the temporal bone, or by the sigmoid or lateral dural sinuses. It may also take a cephalad course through a congenital fenestration of the tegmen mastoideum (roof of the mastoid cavity). The infection crosses the temporal bone periostium and breaches the inner cortex entering its medullary space as pyogenicosteomyelitis. Subsequently, the infection may exit the outer cortex of the temporal bone and terminate in the subgaleal space where it is called Pott puffy tumor. If the infection penetrates the inner cortex of the temporal bone, it can cause an epidural or brain abscess. The pathogenesis of ectopic temporo-parietal Pott puffy tumor is similar, except the origen of the infection is acute otomastoiditis instead of acute frontal sinusitis. Populations at risk for suppurative complications of acute oto-mastoiditis include individuals with infections due to potentially invasive bacterial species such as group A streptococcus, Staphylococcus aureus, Streptococcus pneumonae , or Fusobacterium necrophorum; individuals who have defects in the tegmen mastoideum (roof of the mastoid); defects of the oval window or stapes footplate; or a Mondini dysplasia of the basal turn of the cochlea and labyrinth system. We recently diagnosed and managed a 4-year-old boy with Pott puffy tumor subgaleal abscess located in the temporalis portion of his scalpwith an associated epidural abscess (Figure 1). At surgery, the patient was found to have several congenital fenestra in the tegmen mastoideum that permitted the infection to escape the confines of the oto-mastoid air space and spread superiorly, invading the temporal bone, subgaleal space above the auricle (ectopic Pott puffy tumor), and epidural space (epidural abscess). The purpose of this case report is to educate pediatricians about the entity of silent mastoiditis and the pathogenesis of ectopic Pott puffy tumor. Figure 1. Pott puffy tumor (outlined in blue). media and prescribed amoxicillin suspension (60 mg/kg/ day), in three divided doses. Because of unimproved otalgia and persistent fever, the child returned 72 hours later. A pediatrician diagnosed unimproved acute otitis media changed the antibiotic to amoxicillin-clavulanatesuspension (1200 mg/kg/day in two divided doses). Ten days later, the boy returned to the pediatrician’s office because the localized headache, previously noted, had intensified and now interfered with his sleep. Symptoms of vomiting, visual disturbance, or poor coordination were absent. There were no signs of otorrhea or mastoid inflammation. The pediatrician noted that the tympanic membrane was no longer bulging; however, otitis media with effusion (middle ear effusion) was detected. The office neurologic examination was reported as “negative”. The mother was advised to consult with a pediatric neurologist if the headache was still present after another 7 days. One week later a (3 weeks after first pediatric office visit), the boy returned because of persistent and intensified left temporal localized headache. There were still no signs of increased intracranial pressure or focal neurological deficits. The tympanic membrane was described as dull, not bulging, and there was a “serous middle ear effusion”. Six days later (4 weeks after visit 1), our patient was noted to have a painful 5 × 8 cm boggy swelling in the temporal area (Figure 1). Vital signs included a temperature of 38.3˚C. The child was responsive and interactive. Re-examination revealed that his left tympanic membrane was dull, red, thickened and completely bulging. The mastoid area was normal, without redness, swelling, or tenderness. There was no downward and outward displacement of the auricle. A complete blood count (CBC) and differential leukocyte count were obtained, as well as a point-of-care C-reactive protein rapid test. These were normal. A culture of peripheral blood was obtained. The child was immediately re-examined by a specialist in otology (TWF), who diagnosed Pott puffy tumor of the temporalis region of the scalp, acute otitis media, and probable silent subacute mastoiditis. Ceftriaxone (1000 mg) was administered intramuscularly in the office. The child was directly admitted to a local children’s hospital. Contrast-enhanced, thin-section high-resolution computed tomography (CT) scans of the left temporal bone, brain, and soft tissue of the left temporalis area were obtained. The radiologist’s impressions were left otitis media, opacification of the left mastoid air cells without erosion of the mastoid trabeculae but with several fenestra in the tegmen mastoideum (the presumed route of spread of the suppurative process), focal erosions through the squamosal portion of the left temporal bone (entrance point for the intracranial spread of suppuration), and a subgaleal abscess above the squamous portion of the temporal bone. A 2.0 × 0.4 cm, lensshaped epidural empyema was seen on the CT (Figure 2). A pediatric infectious disease consultation was obtained. The patient was empirically treated with vancomycin, 60 mg/kg/day in four divided doses; ceftriaxone (100 mg/ kg/day in two divided doses; and metronidazole 30 mg/ kg/day in three divided doses. On hospital day 2, he underwent tympanocentesis of the middle ear, insertion of pressure-equalizing tubes, and incision and drainage of the subgaleal abscess. Cultures and Gram stains were obtained from the exudates of both middle ears and the subgaleal abscess. On hospital day 3, a repeat contrastenhanced CT scan was performed. The epidural abscess and the subgaleal abscesses were almost completely resolved. The left middle ear cleft was now pneumatized and the mastoid space had small air bubbles within the mastoid effusion. By hospital day 6, the culture plates (middle ear aspirates and subgaleal abscess specimen) showed no growth, probably because high dose antibiotics were administered for 24 hours before incision and culture of the abscess contents and middle ear. After insertion of a percutaneously inserted central venous catheter, the child was discharged from the hospital in good condition. One month later, a repeat CT scan was taken and there appeared to be extensive granuloma filling the mastoid cavity (Figure 3). The otolgist surgeon scheduled a mastoidectomy for the next day. The mastoid cavity was explored and debrided of a mass of rubbery granulomatous material and the defects in the tegmentummastoideum were closed. The child did well post-operatively and suffers no loss of hearing. Figure 2. Pott puffy tumor (subgaleal abscess) and epidural abscess. Figure 3. Post-antibiotic treatment, non-contrast CT scan of infectious site. subgaleal abscess that is an outward projection of a frontal bone subperiosteal abscess. The source of infection is almost always frontal sinusitis. The most common organisms isolated from frontal Pott puffy tumor are Staphylococcus aureus, alpha-hemolytic streptococci, Streptococcus pneumonia, gram-negative aerobic bacteria, and several anaerobic species. Our search of the medical literature revealed only one previous case report of temporo-parietal Pott puffy tumor secondary to silent mastoiditis in a child . 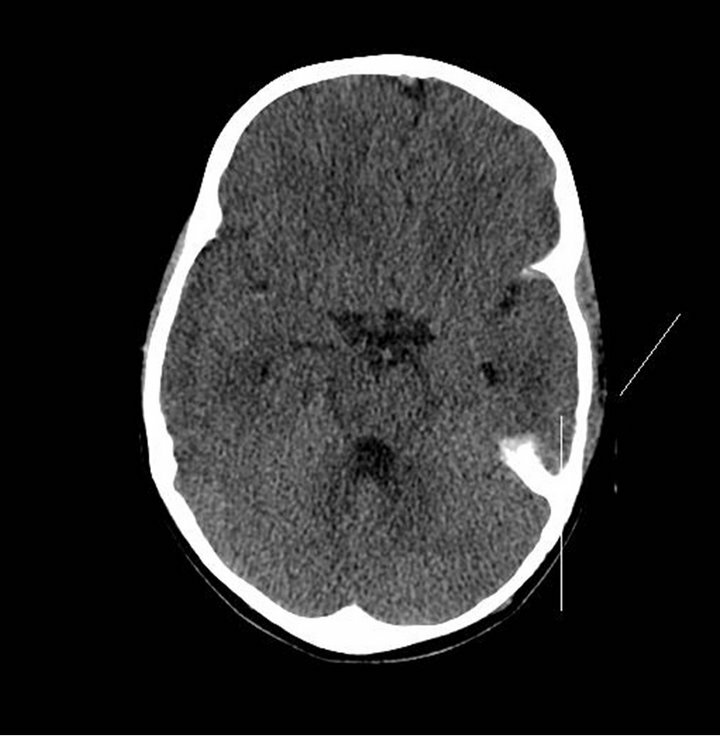 A 10-year old girl with a 10 × 10 cm temporo-parietal subgaleal abscess containing 750 mL of purulent material, and an epidural abscess was reported by a neurosurgeon from a teaching hospital in Saudi Arabia . Silent mastoiditis is well known to otolaryngologists but not to pediatricians [5,6]. Although the mastoid area is often involved with simple acute otitis media, silent mastoiditis conveys an infection that can be more difficult to treat than simple acute otitis media. Silent mastoiditis occurs without destruction of the mastoid trabeculae. There is no coalescence of the infection or subperiosteal abscess, both of which are necessary precursors of the clinical signs of progressive acute mastoiditis. Signs of coalescent mastoiditis include downward and outward displacement of the affected auricle and swelling, redness, and tenderness over the mastoid bump. Silent mastoiditis has none of these signs. Silent mastoiditis is usually quiescent; rarely, the infectious process may migrate superiorly through a congenital dehiscence of the tegmen mastoideum. Our patient had several suppurative complications of mastoiditis including temporal bone osteomyelitis, temporal bone subperiosteal abscess, temporal lobe epiduralabscess, and finally the development of his subgaleal abscess (Pott puffy tumor). All of these, we believe, were fascilitated by the fenestra of the tegmen mastoideum. Our patient’s medical complaints began one month prior to the development of Pott puffy tumor with a localized headache. Symptoms and signs of acute otitis media were observed two weeks later. Management of this child’s infections was divided into management decisions regarding the oto-mastoid infection and neurosurgical decisions regarding management of the epidural abscess. Management of acute or chronic mastoiditis consists of a combination of antibiotics administered intravenously and surgery. Surgical intervention includes tympanocentesis and insertion of pressure-equalizing tympanostomy tubes. Gram stain, and aerobic and anaerobic cultures of the middle ear exudate is advisable, but may not demonstrate bacteria if the cultures are obtained after the child received several doses of antimicrobial therapy. Polymerase Chain Reaction has been shown to greatly improve the detection of specific bacterial pathogens in septic arthritis, when traditional culture methods were reported as negative. We did not order PCR for the culture specimens obtained by surgery. Epidural abscess, a suppurative inflammation between the outermost layer of the meninges (dura) and the overlying skullis more common than subdural empyema when it is secondary to suppurative mastoiditis . Symptoms of epidural abscess are often quite insidious, with slow progression over weeks to months. The reason for this is that an epidural abscess is encapsulated with its characteristic biconvex lens-shape on contrast-enhanced CT. Persistent symptoms of mastoiditis include otalgia, fever, and/or otorrhea. When an epidural abscess is present, fever is inconsistent; a progressively painful well-localized headache, as in our patient, may be the only symptom . Nausea, projectile vomiting, nuchal rigidity, and papilledema, usually occur only after the suppuration has entered the subdural space. The vital signs of children with epidural abscess and skull bone osteomyelitis are usually normal, or mildly abnormal, with low-grade intermittent fever and mild tachycardia. Leukocyte count and acute phase reactant result may be deceptively normal. Contrast-enhanced CT is usually the initial imaging modality of choice because it can be obtained more rapidly than magnetic resonance imaging (MR), and often without the need for deep sedation necessary for MR. The contrast-enhanced CT image of an epidural abscess appears as a hypodense, biconcave, lenticular, shape in the epidural space. 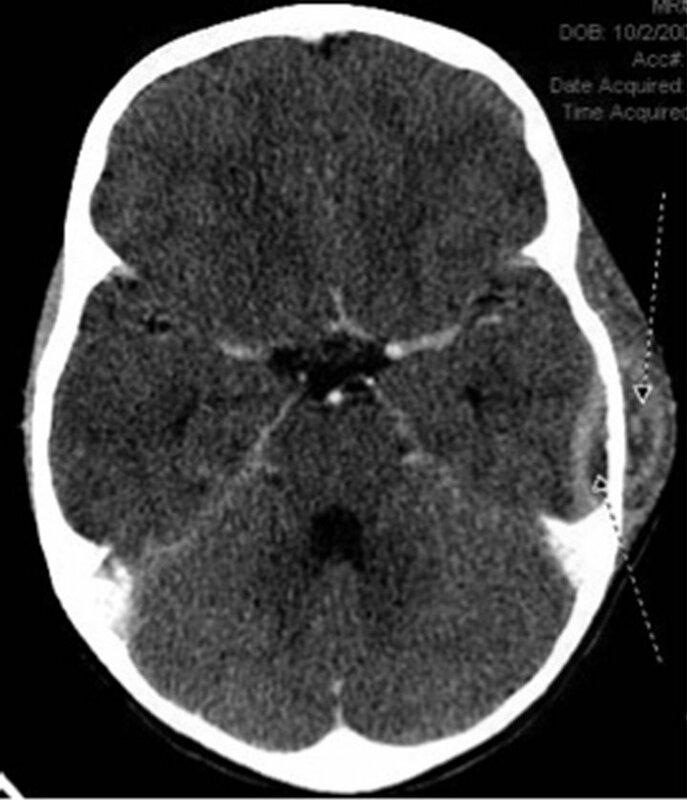 Contrast-enhanced MR is superior in depicting small intracranial suppurative complications or vascular or dural sinus thrombosis that may not be identified with CT.
A small epidural abscess may be managed with intravenous administration of antibiotic therapy, targeting those bacteria that usually cause such an abscess. Should the intracranial abscess, despite well-chosen antibiotics grow or become symptomatic due to mass effect, increased intracranial pressure, or should there be persistent fever accompanied by persistent leukocytosis, neutrophilia and/or elevated C-reactive protein, surgical evacuation of the abscess is mandatory. Analysis of this case should help to educate pediatricians about the entity of silent mastoiditis and the description and pathogenesis of Pott puffy tumor in an ectopic location. A 4-year-old boy was admitted to hospital with suppurative complications of acute otitis media that had been unresponsive to a full course of treatment with amoxicillin-clavulanate suspension. The complications included silent mastoiditis, epidural abscess, subperiosteal abscess of the temporal bone, and a temporal bone subgaleal abscess (Pott puffy tumor). This is only the second published pediatric case report of temporalis region ectopic Pott puffy tumor as a complication of silent mastoiditis. Zapalac, J.S., Billings, K.R., Schwade, N.D., Peter, S. and Roland, P.S. (2002) Suppurative complications of acute otitis media in the era of antibiotic resistance. Archives of Otolaryngology—Head and Neck Surgery, 128, 660-663. Agrawal, A., Pratap, A. and Tiwari, A. (2009) Imaging findings in a neglected case of chronic otitis media. Journal of the Pakistan Medical Association, 59, 785-786.